Riedell Backpack with inner compartments. This Riedell Roller skate bag is a well made- straight forward take on a skate bag. If you are tired of squeezing your skates in with your school books or gym bag- the Riedell One pack is an elegant and simple solution. The compact Riedell One Pack holds up to a pair of size 9 low-cut skates and features a separate outside compartment and an adjustable shoulder strap. Riedell Radar Wheelie Bag - fits 8 wheels ( with bearings). 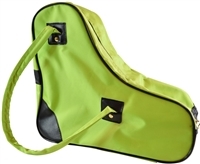 Double handle / double zipper design makes the bag easy to carry, load and unload.